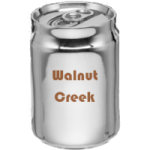 The 100k of Walnut Creek takes advantage of almost all the existing trail at Walnut Creek Park. It's fast, twisty and flowy. There are almost no rocks, ledges, etc. This is the easiest course of the series. Note that there will be several group starts (fastest riders, faster riders, fast riders, regular riders, etc.) limited by the number of guides. You MUST go on one of these pilot rides to know the route - it's very twisty and it does deviate from the traditional loop. Please refer to the rules for more information on sharing the trail, getting lost, DNFing, etc. Here is a completed ride from 2012. You can click on the 'others' link near the top of the ride to view other people who also rode that year.